News flash: I am living in the arctic tundra. Not really. Still Denver. But it looks like the arctic tundra. It feels like the arctic tundra! It is not just cold, people, it’s downright frigid! If it was 100 degrees warmer, I would not be sad. Meaning: “if it were only 80 degrees outside.” That’s right! It hit 20-degrees-below-ZERO in parts of Colorado yesterday, which was common when we lived in the perpetually icy Minot, ND and the main reason we do not live there now! Ay-yi-yi! But, you know, standing at the window with a steaming cup of coffee in my hand, I can look out at the snow sparkling in the sunlight on New Year’s Eve and be quite romantic and idealistic about it. For now, anyway. 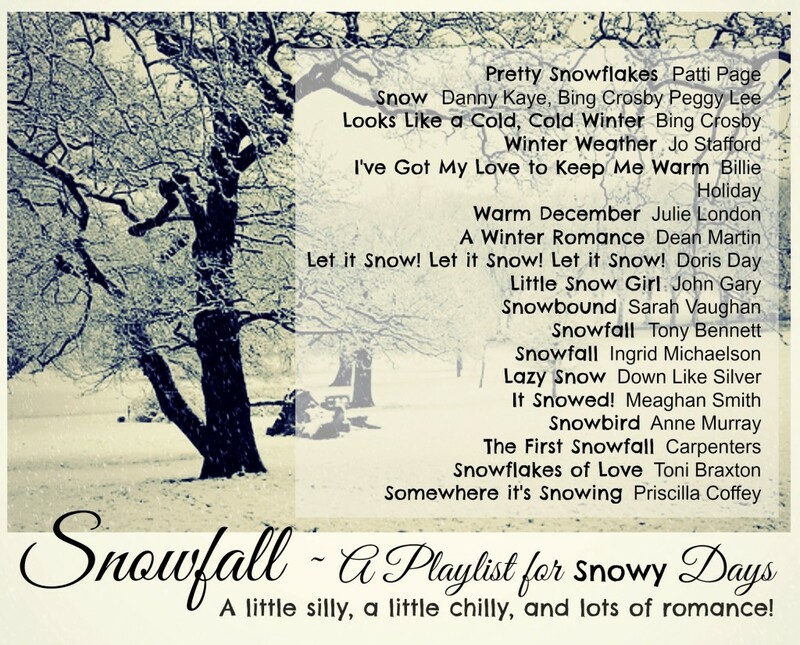 Includes: Lots of standards (like Snow from the movie, White Christmas, and A Winter Romance by Dean Martin, some Bing, some Sarah Vaughan, and even Julie London), a little pop (The First Snowfall, Carpenters), a nod to country (Anne Murray’s Snowbird), some bright-kid-fun-tunes (Pretty Snowflakes by Peggy Lee, Little Snow Girl, too), and a few deeply reflective songs (Lazy Snow and Somewhere it’s Snowing, see lyrics below). That final song encapsulates what the snow always really reminds me of, when fresh snow, like grace, covers the faded, dormant landscape. The imperfections are evened out, the brown leaves along fence lines and even the litter in highway ditches get covered in a thick blanket of white purity. And underneath it all, where the eye can’t see, magic is happening. The snowflakes have joined hands to hide the forthcoming, joyous surprise ~ The Creator is fashioning a spring, having sent snow from His storehouses (reserved for times of trouble, stockpiled for when we need it most, see Job 38.22-23). The snow is suspended moisture. It speaks of a future, of a spring-green hope, His word in us, causing growth and fruitfulness again, regardless of how dead or lifeless our fields look today. Grace to you, friends and familia on a snow-covered day in Colorado.